← Were the Orioles Quitters? On Tuesday I mentioned some off-season baseball reading I’m doing thanks to the Barnes & Noble clearance rack. Today I want to revisit a book I read this summer because the publisher sent me a copy for free. Forget best-seller lists, my reading choices are strictly economic. I wrote my review of High Heat on Roar from 34 in early July. I later posted a transcript of the interview I conducted with author Tim Wendel. Here are a few of my favorite excerpts from that conversation. Wendel on the Joel Zumaya injury and the physical challenge of throwing triple-digit heat, an exchange made all the more interesting in hindsight given Strasburg’s injury weeks after we conducted the interview. Yeah. You know It pained me to see what happened with Zumaya, because Zumaya made the list of maybe the top dozen fireballers in High Heat in part because more of the potential and the promise more than anything he’s done so far. I guess it shows how fine the line is and how much stress, and torque, and punishment the arm takes when you’re talking about throwing this hard. At times we tend to take a lot of this for granted as fans or maybe people who cover the game. Strasburg, for example, is doing phenomenal right now. I think he certainly has proven he’s more ready for prime time than the eight other guys he’s taking the field with half the time. I was watching the game when he was in Cleveland and he was having trouble with the mound and at one point he slipped and you just go “Oh!” All it takes is something like that and there goes a career. Will Joel Zumaya ever throw as hard as he once did? I don’t know after watching the tape of what happened last night. You talk about Sandy Koufax who went literally in three weeks from a journeyman to all world and being able to suddenly spot his fastball and suddenly gain control of his curve. You look at the price he paid in terms of what it did to his arm, the arthritis, the types of medications he was taking just to get through those last couple seasons. Even someone like Nolan Ryan who could probably go out today and throw, I don’t know, probably 92 or 93, still just the mental anguish he went through. I think sometimes we just kind of think “Oh yeah, somebody like Stephen Strasburg, he’s got it made” or somebody like Sandy Koufax, “Yeah, Hall of Fame,” and you don’t see the price and you don’t see the real things they had to go through. They all know this next pitch might be my last one. You had to think that’s what ran through poor Joel Zumaya’s head last night. Wendel on Earl Weaver, Steve Dalkowski, and how good Dalkowski’s stuff must have been if he made the High Heat list even though he never caught on in the majors. You know, I think part of it is just the mythic element. You’ve seen Bull Durham, the Nuke LaLoosh character being in a sense the myth of what Dalkowski was. That was certainly helped by the fact Ron Shelton, who went on to be a Hollywood writer and director, was in the Orioles organization about four or five years behind Dalkowski. He never played on the same team as Steve, but he knew all the stories and such. The stories of his fastball are just epic, and I think that’s part of what the appeal is too; here you have a very almost very docile guy who wears spectacles at least part of his career. He doesn’t look like an athlete at all. And yet boy did he have a gift. I think in an odd way that really appeals to people. He didn’t look like a Ryan or even a Feller. He looked like some guy you’d walk by on the street, and yet you put him on a mound, granted he couldn’t throw a first strike half the time, but as near as we can tell he threw potentially 104 to maybe 107 miles per hour. And finally, Wendel on the time Tim Lincecum was blocked from the visitor’s clubhouse at Nationals Park. 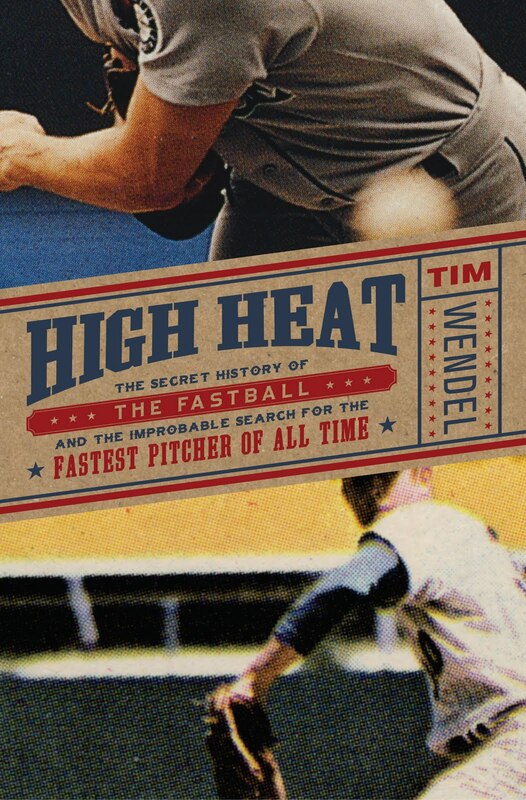 This entry was posted in Baseball Books and tagged Baseball Books, High Heat, Tim Wendel. Bookmark the permalink.